Deer flies swarmed. Mosquitoes the size of hickory nuts lit on the back of my left hand. I could not swat without tucking the Northwest gun under my armpit, and I presumed the little beasties knew that. That morning, in the Year of our Lord, 1795, as I wandered around the cedar grove’s perimeter, the only sound I heard was the constant buzzing of insects. Once again the morning song birds held their tongues, perhaps due to the scorching heat and stifling humidity. At the old apple tree, a lone crow chased a fledgling red-tailed hawk, laboring with a chipmunk dangling from its talons. The crow cawed now and then; it seemed to have lost its heart for the chase, and by then, so had I. The trail’s sandy patches warmed the bottoms of my elk moccasins like a stone resting beside an evening fire. Dragon flies flitted about the meadow’s boundaries as if afraid to wing their way into the center, out in the heat. A wild cherry branch hung limp, broken for no reason, festooned with wilting, withering leaves. A pair of adult Sandhill cranes flew over. I stood and watched. They spoke not. I moved on. The sweltering ramble continued for some time. At the meadow’s east side, I found ample shade and a light wisp of a breeze. I sat cross-legged and began scribbling my impressions on a folded page. The air smelled of hot dirt and damp, fresh-crushed weeds. For some reason the deer flies and mosquitoes abandoned me. Industrious black ants came and went. One crawled over my buckskin leggin. A few sentences along, I looked up and spied the gray head of a half-grown wild turkey, skirting the cedars on the trail that passed the broken cherry branch. In an instant, another head popped up, then another. Over the next few minutes, the heads of seven different birds appeared, disappeared and appeared again as the young fowls wandered north, following the same trail as I had, not long before. “Old Turkey Feathers” rested on my lap, unloaded and still oiled. I watched three birds in particular, the leaders of the flock, and wondered if my alter ego could make the shot, some hundred paces distant. A round ball would have to hug the meadow’s gentle rise and clear the crest before beginning its descent. The death sphere’s path would be a “worm burner,” indeed. As I watched, I recalled the young jake that flew across the big swamp, landed a dozen or so paces away and the three opportunities he presented, in an historical sense, of course. I was reasonably certain I could hit the mark with all three of those shots, but I knew the over-the-meadow shot was another story. So there is no misunderstanding, I feel compelled to share a disclaimer of sorts. 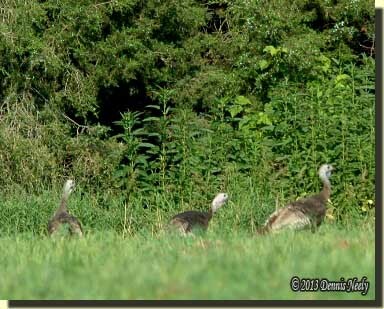 In Michigan, it is not legal to hunt wild turkeys with a solid projectile, and the legal shot size is restricted, too. As a responsible traditional black powder hunter, I adhere to all game laws and seasons, and work them into my hunting scenarios in the form of measured compromise: measuring the circumstance (in this case, modern hunting regulations) and applying a reasonable compromise that does not detract from the essence of the historical hunting scenario. That said, it is not illegal to sit with an empty trade gun on one’s lap and run through a host of “what if” and “could I” situations that mirror the shots taken, or attempted, by my hunter heroes. The upshot of those cogitations are lessons best addressed at the practice range. This summer holds more questions than answers. At every turn, I find myself reaching out to other traditional black powder hunters for their thoughts and insights, but even then, my wonderings seem to grow exponentially. The lessons and resulting questions of the Fort Greeneville Match keep mulling in my mind. From the emails, comments and conversations I have had, other folks are thinking, too. Personally, I have tried to categorize and prioritize the lessons learned from that experience. Those that I have spoken with have different “take-away messages” from my tale, and this is both the beauty and the curse of the wilderness classroom. The major point of my sharing the Fort Greeneville Match was to demonstrate that we should all embrace the opportunities that exist to round out a persona, consistent with historical documentation. We must recognize that our hunter heroes’ life happenings were as diverse as ours are today, within the context of the 18th-century American frontier. As I so often point out, it is simply not enough to change clothes and hunt with a black powder arm. Instead, I urge each living historian, in order to gain full benefit from this hobby, to foster a mental attitude that seeks to re-create the past in a meaningful and truthful manner. With any luck, the end result is a greater understanding of the scant words of a long-dead woodsman, and sometimes, when the smoke clears, we see our historical selves from a completely different perspective. Now I’m shooting a smoothbore, and there are hindrances to that, to say nothing of being far from a lad of “twelve or thirteen years.” But what stuck with me and dovetailed with my current train of thought was the “…soon made him expert in the use of his gun.” With that passage lingering in the dark corners of my mind, it was only natural that I would question my ability to sling a death sphere across the meadow at a target simulating one of those hens. Thus, one of the revelations that came out of defending the fort was the fact that I no longer know the limitations of this aging body or Old Turkey Feathers at distances farther than my normal effective distance. I have grown comfortable and confident hunting with those time-honored parameters. And with that comfort, I fear a bit of complacency has settled in. With my research into using natural materials for wadding, I have come to realize that that distance has been subconsciously reduced. Again, this is all part of being a responsible traditional hunter and respecting the game I chase, but nonetheless, I feel a deep compulsion to return to the practice range and spend the rest of the summer testing and re-evaluating what I think I already know. 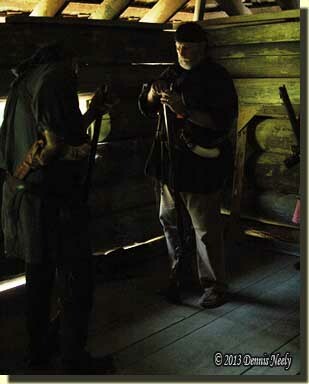 This entry was posted in Persona, Scenarios and tagged Dennis Neely, historical trekking, North West trade gun, Northwest trade gun, trade gun, traditional black powder, traditional black powder hunting, traditional blackpowder, traditional blackpowder hunting. Bookmark the permalink.